In the past ten years Apple has transitioned from being primarily a personal computer maker with annual revenue of just over $5 billion to a global enterprise with literally twenty times the revenue, retail store locations around the world and four major product lines including the popular iPhone line of smartphones. Today I'm taking a look at where the company now makes its money. 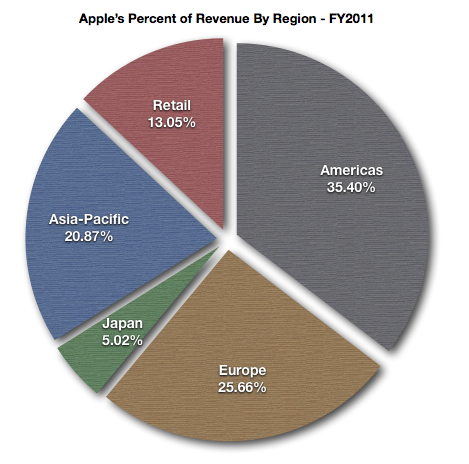 Over 60% of Apple's revenue is currently sourced from the sales of products and services outside the United States. According to the company's regulatory filings, Apple "manages its business primarily on a geographic basis." The company's geographic segments consist of the Americas, Europe, Japan, Asia-Pacific and Retail. For Apple's current fiscal year (FY2012) ending in September, I estimate revenue growth of 57% to $170 billion. This is following the 66% revenue rise to $108.249 billion that occurred last fiscal year. The company's strong rates of revenue growth are fueled in part by continuing international expansion. When Apple retail store sales are assigned to the countries of sales origin, Apple's FY2011 revenue from US sales comes in at $41.812 billion. This represents 38.6% of the fiscal year's total. I expect the US to deliver about 37% of reported revenue in FY2012 on revenue growth of at least 50% in the region. As early as FY2013, non-US revenue sources may deliver 67% or two-thirds of the company's top line number. China is the only country outside of the US to deliver over 10% of recognized revenue in FY2011. China's $12.472 billion in revenue represented 11.52% of the company's $108.249 billion total. In fiscal years 2011 and 2010, revenue growth in the Asia-Pacific segment exceeded 150% and in FY2011 Asia-Pacific delivered almost 21% of the company's recognized revenue. In FY2012, I expect the Asia-Pacific region, inclusive of China, to surpass Europe in revenue generation and become Apple's second largest geographic revenue segment. The graph below illustrates and delineates revenue by geographic segment and the rate of revenue growth of each segment in FY2011. The Asia-Pacific segment delivered 174% revenue growth in the fiscal year followed distantly by the 56% revenue growth rate in the Americas. In fiscal years 2011 and 2010, the rate of revenue growth for the retail stores was below the rate of revenue growth for the company as a whole. In the recent September quarter, year-over-year retail store revenue grew only 1% despite about a 12% increase in the number of store locations and a 25% increase in Macs sold through the stores to almost 1.1 million units in the three-month period. Apple is moving aggressively to open new stores in the company's emerging product markets. The revenue performance of the retail stores is impacted by the company's product refresh cycles and the increasing number of carriers selling the iPhone directly to customers. The Asia-Pacific geographic segment is Apple's fastest growing segment. The region includes Australia and all Asian countries other than Japan. In fiscal years 2012 and 2013, the region will continue to report strong rates of revenue growth as a second major iPhone carrier is eventually added in China and as Apple products become more accessible to that nation's burgeoning middle class. The Americas geographic segment includes all countries in North and South America, including the United States. The simultaneous launch of the iPhone 4S on the three largest carriers in the US will provide a big boost to domestic revenue growth in the first two quarters of the current fiscal year and consequently revenue growth in the region as a whole. Developing countries in the Americas, including Brazil, are catalysts for strong revenue growth in the region for the next few years. Apple maintains high gross margins on products sold. The average gross margin on each revenue dollar in FY2011 was 40.5%. With operating expenses at less than 10% of revenue, in FY2011, 31.22% of each revenue dollar flowed to the operating income line. Apple's international expansion has actually led to an increase in the percentage of revenue that flows from the top line to the net income bottom line. Not only are taxes on operating income lower outside the United States, Apple has been able to preserve average gross margins through product pricing control while revenue has risen dramatically. In FY2012, Apple will surpass HP to become the nation's largest technology company. Apple's strong rates of revenue and earnings growth are increasingly sourced from product sales outside the United States. Operating income as a percentage of revenue continues to rise as the company's global product sales presence expands. I maintain a $640 price target on the shares and I expect the December quarter results to confirm the high rates of revenue and earnings growth achieved over the two most recent fiscal years will continue through the current fiscal year. For FY 2012, I expect revenue of $170 billion and eps of $46 per share.